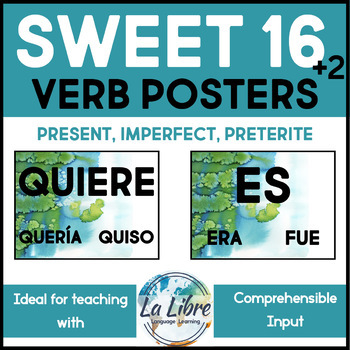 These 16 Spanish posters from Mike Peto’s “Sweet 16” set of high-frequency past tense structures will keep your students in the target language and help them pick up new vocabulary, especially when using circling techniques for TPRS. This Spanish word wall of 16 high-frequency verbs are in 3rd-person present tense, preterite, and imperfect tenses. 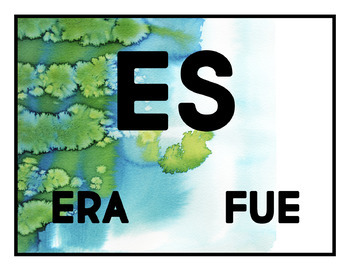 The mix of past tense is ideal for your Level 2-4 Novice-High to Intermediate Spanish learners. 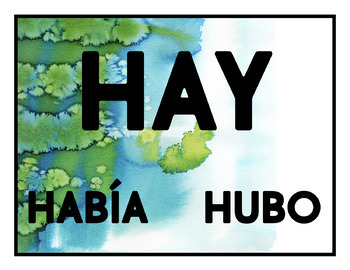 Post them in the front of the room to use as reference when teaching with comprehensible input-and feel confident that your students will be familiar with the most used verbs in the language! Print on cardstock and laminate for extra durability. Posters are a full page per word and includes 18 total posters. 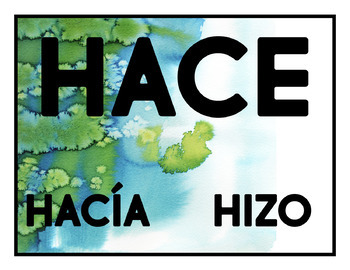 Posters are hand-painted blue-green watercolor and salt design with bold, clear text.